Here you may read about the Catacombs of Kom es-Shouqafa and its main attractions. Find out more about what you may observe there. The graves were tunneled into the bedrock in the age of the Antonine emperors (2nd century A.D.) for a single wealthy family still practicing the ancient religion. 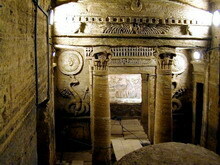 These catacombs represent the last existing major construction for the sake of the old Egyptian religion. The Catacombs of Kom es-Shouqafa are alone worth the trip to Alexandria. The architects and artists were schooled in the Greco-Roman style, though the funerary motifs are pure ancient Egyptian. Due to the themes of Ancient Egyptian religion, it has resulted in an amazing integrated art, quite unlike anything else in the world. The visitors will descend several levels deep into the ground on winding staircase, with little chapels opening from it, furnished with benches to accommodate visitors or mourners bringing offerings. Sarcophagi are held in niches cutout for them. The main chambers are lit by a single electric light bulb that throws the chamber into green, a perfect staging for that composite art. The familiar solar disk is carved in the center of the facade below fresco of serpents. There are two serpents with the crowns of upper and lower Egypt, left and right. They are not in fact the lithe cobras of Saqqara or Thebes. These snakes seemed to be designed as modern book comics. The dead lies in the Tomb Chamber on a lion-shaped bier attended by Horus, Thoth, Anubis, and other known funerary deities and funerary gear: Canopic jars, the priest in his panther skin, and the king making an offering to the deceased in the form of Osiris. All of the figures are rendered in Greco-Roman style. In addition to the traditional scenes, there are bunches of grapes, Medusa heads, and a variety of Greek and Roman decorative devices.